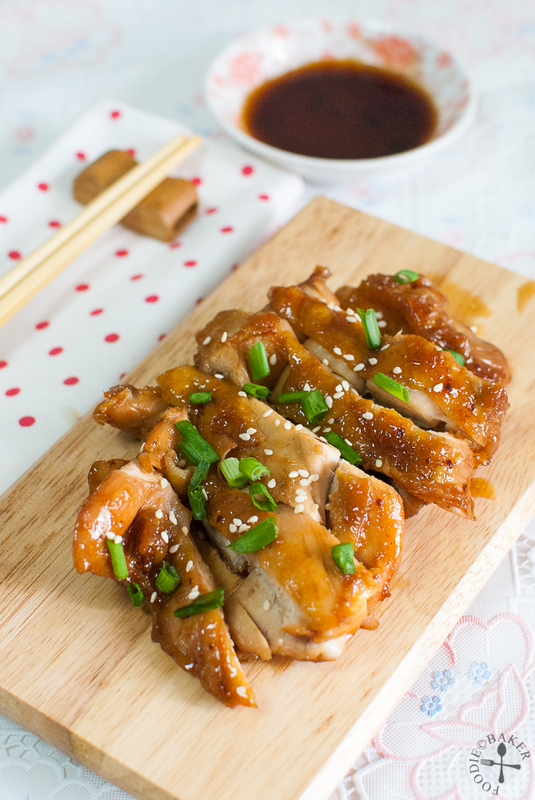 I’m sure many of you are very familiar with this dish Teriyaki Chicken. Teri refers to the shiny sheen that the teriyaki sauce forms on the surface of the chicken, while yaki means grilled. 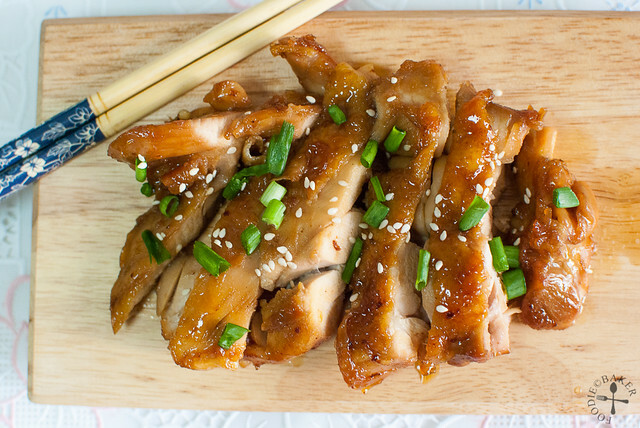 Hence, the original dish is made by grilling the chicken and then basting it with a sweet soy sauce. But honestly… grilling in the house? It sounds like smoke and oil spurting everywhere to me. Haha. So I’ve found a very easy recipe that’s made all inside one frying pan. I’ve used deboned chicken thigh and I highly recommend this part of the chicken as the meat is very tender, moist and juicy here, as compared to the chicken breast. This sweet and sticky sauce is definitely to die for! It’s a pity that I don’t have a bowl of rice to eat with the chicken. My apologies for not having step-by-step photos for this post! If you’ve followed me on Instagram (@foodiebaker), you would have noticed me posting a video of me making the teriyaki chicken. The video’s really amateurish, so pardon the quality! But I was so engrossed in taking the video that I have forgotten to take photos… here’s the video! I hope it will suffice should you want to make this recipe! I’m submitting this recipe to Little Thumbs Up organised by Doreen from my little favourite DIY and Zoe from Bake for Happy Kids. This month’s theme is Soy – hosted by Mich from Piece of Cake. The recipes are all linked at this post! I’m also submitting this to Asian Food Fest #1 Oct 2013: Japan, hosted by Alan from travelling foodies. Rinse the chicken and trim off excess fats. Pat dry with paper towel. Rub the grated ginger and salt all over the chicken thigh and set aside for 30 minutes. Pat dry again with paper towel, removing as much ginger as possible. Heat a frying pan over medium heat. Add in oil and when the oil is hot. Add in the chicken thigh, skin side down, and fry for 3 to 5 minutes until the skin is crispy. Turn the chicken and working quickly, add in sake and cover the frying pan. Lower the heat to medium-low and steam-cook the chicken for 3 to 5 minutes until chicken is cooked through. While the chicken is steam-cooking, combine the sauce ingredients. After the chicken is cooked, pour in the sauce and turn up the heat to medium. Flip the chicken frequently, basting it in the sauce. After a few minutes, the sauce will start to thicken and become sticky. The chicken will be have a shiny surface. Transfer the chicken to a chopping board and slice it into thick chunks. Transfer it onto a serving platter (or on top a bowl of rice) and sprinkle with sesame seeds and spring onion. Pour the sauce into a small serving side dish and serve. Cooking sake is known as ryorishu (料理酒) in Japanese, a type of Japanese rice wine. It is clear in colour and has the viscosity of water. It helps to tenderize meat and get rid of the unpleasant smell. In many Japanese recipes, food is often marinated with sake then rinsed before cooking. If you cannot find Japanese cooking sake, opt for a rice wine. Mirin (みりん) is also a type of Japanese rice wine, but has a light golden colour and is more syrupy. It is sweet in taste, but the depth of its sweetness is different from regular sugar. It also helps to tenderize meat and get rid of unpleasant smell as well. If you cannot find mirin, dissolve 1 teaspoon of sugar into every tablespoon of cooking sake – but note that the taste will be different as compared to using mirin itself. Hi which type or brand of honey do you use? Mmmmm this looks delicious! Will definitely try this recipe! Hi Jasline, after so long not visiting you, I was welcomed by this salivating dish! The chicken looks juicy with the teriyaki sauce. I basically cookt this dish once a week, but using store-bought sweet teriyaki sauce, hehehe. Jasline this Teriyaki kitchen look wonderful, love the pictures! Hi Liz, thank you for the compliment! Yes chicken thigh are a lot more tender than chicken breasts! You are upgrading your blog to vblog… Nice! For some privacy reason, I have chosen not sign up histagram. Sorry! Otherwise, I would love to see your video. Hi Zoe, thank you! No worries! You can still see the video and the photos at the link here: http://www.instagram.com/foodiebaker if you’d like! Hi Jasline, your chicken looks so delicious, I just placed an order for teriyaki chicken for my Airasia meal 😀 I hope it would be as delicious as yours! Thank you Jeannie! Where are you travelling to? Have a great holiday! Great looking chicken and presentation! I love teriyaki chicken!! Yours looks so delicious, I’ll have to try your recipe! Hi Cate, thank you! I hope you’ll like it as much as I do! Hi Phong Hong, thank you for the compliment! Yea chicken breast can be too dry sometimes! Your chicken looks so, so delicious! The only magic I’m wishing right now, is for that serving of chicken appears on my dining table tonight! Yums! Hi Joyce, thank you! I hope you can make some for you and your family soon! Your teriyaki chicken looks fabulous! I wanted to reach into the screen and grab some! i’m salute for you since you made the teriyaki sauce from scratch…. Thank you! I’ve not bought teriyaki sauce from the bottle itself before, so not sure how it tastes… but I’m surprised how easy it is to make the sauce! You are welcome Nee! If you give it a try some day do let me know!